Firmly anchored in your jaw and protected by an outer coating of tough enamel, your teeth are remarkably strong — yet it's still possible for them to chip, crack, or even break. In fact, there is some evidence that today, our teeth are developing cracks at a record rate. This may be due to the fact that people are living longer (giving teeth more time to accumulate damage), or that our stress levels are increasing (which may cause teeth clenching and grinding). Biting on hard objects, receiving a blow to the mouth, or having large cavities (or old amalgam fillings) that weaken the tooth's structure are also common causes of tooth fractures. But no matter of the cause, there are a number of symptoms that indicate a tooth may be cracked, and several treatments we can offer, depending on the severity of the injury. 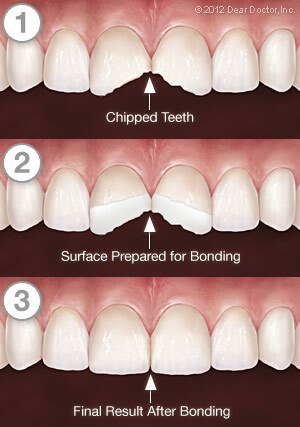 Small chips on the edges or cusps of teeth often cause no symptoms, and can be treated by cosmetic bonding or other methods. Deeply fractured teeth, on the other hand, may be a serious problem. The sooner they are treated, the more likely it is that the affected tooth can be saved. Let's take a look closer look at the types of fractures teeth can develop, and the symptoms they may produce. These tiny fissures in the outer enamel of the tooth often cause few or no symptoms; in fact, most don't require treatment. If you are having tooth pain, however, these cracks will need to be evaluated and possibly treated. That's because without a careful examination, there is no way to know for sure whether these cracks go into only the enamel, or if they penetrate into the dentin (inner body) of the tooth. While the tiniest craze lines don't show up on X-rays, they can often be detected by feel (using a small instrument called an explorer), by having you close down on a “bite stick,” or by using special dye stains or high-magnification instruments. This type of crack often starts at the chewing surface and extends toward the roots — but may it also begin in the root and continue toward the crown. Either way, it doesn't completely separate the tooth into two parts. Depending on the extent of the fracture, you may feel only minor discomfort that occurs in response to temperature changes (with hot or cold beverages, for example); or, it may produce sharp pain when you chew. In any case, you shouldn't ignore the symptoms, because cracked teeth require dental treatment quickly to keep them from progressing further. If the cracks continue to progress, tooth extraction may become necessary. When serious fractures occur, you'll know it: The distinct parts of the tooth can be separated from each other, and tooth's pulp is often inflamed and painful. This condition requires immediate treatment, and it's rarely possible to save the affected tooth. 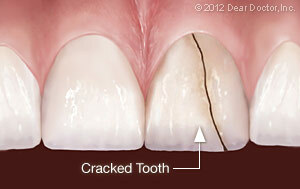 What treatment is best for a cracked tooth depends on the extent and the severity of the damage. If a small crack is detected early enough, it's often possible to seal the fissure with restorative materials. For larger cracks that involve the pulp of the tooth, root canal treatment is generally required. Afterward, the visible structure of the tooth may be restored with a crown or “cap.” Sometimes, additional procedures may be recommended to try and save the tooth. In the most severe cases, however, the tooth will need to be extracted. The preferred treatment for cracked teeth is — you guessed it — prevention! Wearing proper protective equipment (including a custom-fitted mouthguard) when playing sports, and staying alert to dangerous situations (like distracted or impaired driving) can help keep you safe. So can regular dental checkups, where your teeth are examined carefully for early signs of a problem. However, if you experience any symptoms that could indicate a cracked tooth, don't wait: The sooner it's treated, the better the chance that we can save it. Orange County - Dentures & Dental Implants by Dr. Mohammad Kasem, B.D.S. Dr. Kasem has many affiliations with organizations like: The International Congress of Oral Implantology, American Dental Association and The Academy of General Dentistry.